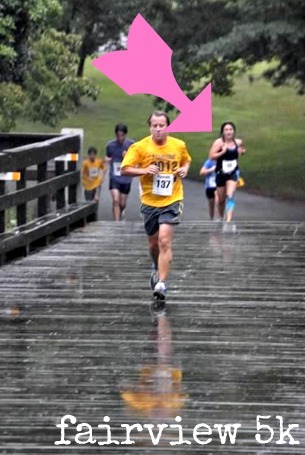 Again, nowhere near PR, but this course was a little crazy..
…as was the weather. Evidence? 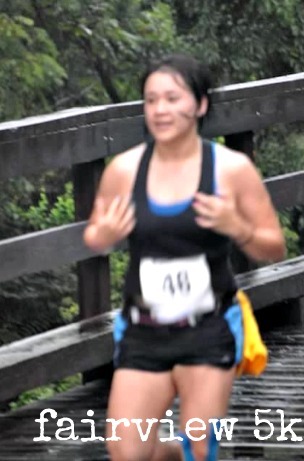 Seriously, do you want tips on how to look attractive when running a rainy 5k? All proceeds are donated to charity – I have absolutely no problem with paying higher race fees if I know they’re going to a good cause (this one: American Cancer Society). I didn’t make excuses / quit running – despite the fact that I really couldn’t see because an awesome mix of rain and sweat were blinding me for about .75 miles. I ran naked – um, no, not quite Meghann-style, but honestly, almost as scary: I ran without my Garmin. 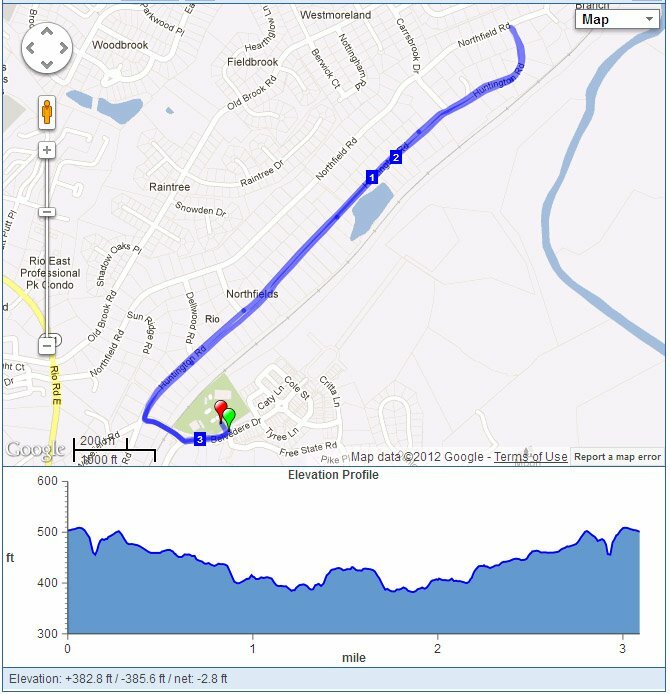 The Garmin-less thing was something that I decided to do this week, after reading some of Dre’s posts about running for feel. I reaffirmed this decision this morning when Leah gave me a quick overview of the course (DOWNHILL then UPHILL). Um yup, I looked around at the start – surrounded by kids – and decided that today was not a day to PR – it was to judge my pacing skills. Just like the last race, there were volunteers calling out times at mile markers. Considering I even split 1 and 2 and that last mile was rainapalooza uphill, I felt super good! I didn’t get anywhere near last race’s CRASH AND BURN feeling at the end of the race and still beat the last time by 13 seconds. All considered, I am looking forward to the fall even more for 5Ks and 10Ks to improve upon, and soon, even beat my standing 5K PR of 23:28! NICE Job Krissy! and in the rain, your a stud! You never take a bad picture Krissy 🙂 Well done! Nice work! Great that you ditched the Garmin–I did a post on this last week. There’s a lot of value in doing that. 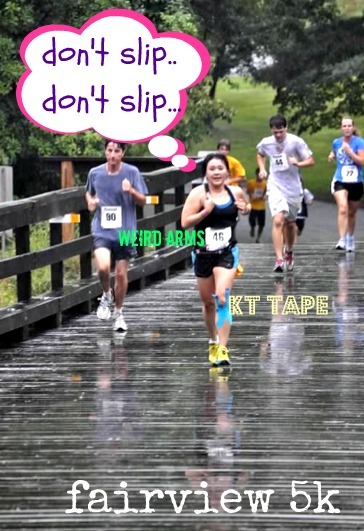 And yes, 5ks can be nerve-wracking b/c you know they have to hurt!! Nice job! I did a half one time with no Garmin (didn’t charge right) and surprisingly my time was about the same as the one before it! Running for feel can be good for sure. I agree that 5Ks make me more nervous – it’s a distance that seems like it should be ‘easier’ but isn’t AT ALL. They hurt. Congrats!! How on earth do you get such consistent splits? Same exact time on mile 1 AND mile 2? dang, girl… and even with rolling hills! Hey Lizzie ! I have no idea! It was freaky/awesome. Nice rainy race! I’ve done a couple of 5ks without a watch and was oddly happy about it. Better to just go and not think about it. So true. Not sure if I could do it for a longer run, though!